The tantalizing thought that a major work by Bach, long considered lost, might actually be extant, just waiting to be discovered, would be enough to whet the investigative appetite of any entrepreneurial performer. 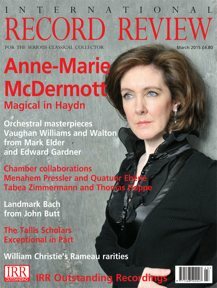 Such an opportunity is described by Raphaël Pichon, director of the group Pygmalion, who recounts the exciting moment he realized that all that stood between him and the rediscovery of the missing Trauermusik, BWV244a, was some musicological sleuthing and a bit of creative licence. The Trauermusik supplied by Bach for the 1729 funeral of Prince Leopold of Anhalt‑Cöthen, was known only from its surviving libretto. As for the music, the results of Pichon's 'hunt for buried treasure', as he puts it, are contained here. The clue to the whercabouts of the music lies in its catalogue number: that all important 'a’ signifies not only its link with another work, BWV244, otherwise known as the St Matthew Passion, but also the initial belief (later proved false) that the work was the origin of some of the music that was subsequently used in the Passion. 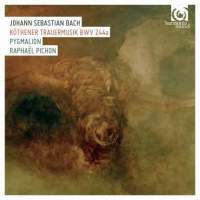 In fact it turned out to be the Passion that provided some of the music for the Trauermusik, a revelation that rather muted interest in the latter. The treasure trail that Pichon and his collaborator Morgan Jourdain have followed is actually fairly well trodden, and the treasure itself has for many years been not so much buried as hiding in plain sight. The groundwork was done as long ago as the late nineteenth century when one astute musicologist showed that the poetic texts in the libretto match those of movements not only in the Passion but also in the Trauerode, BWV198, another funeral work by Bach, and this too turned out to be a source for BWV244a. Bach had evidently pulled together BWV244a from existing works, re‑purposing some of their best music for Leopold's funeral obsequies. These events commenced with an evening observance and concluded with a service the next morning; both included music, and the Trauermusik, so the booklet notes tell us, was performed at the morning service. What a feast of music Bach provided. The Trauermusik is a compendium of excellence, essentially a cycle of four cantatas containing re‑texted arias and choruses immediately familiar from their better‑known parent works. For the interlinking recitatives, whose prose texts make it difficult to trace lines of ancestry to pre‑existing music, Jourdain describes a process of trial and error before settling, with some judicious tweaking, on sorne of the richly sonorous accompagnato passages mostly from the Passion, and newly composing another. This makes for a particularly sumptuous sequence of music. It's unfortunate, therefore, that the music performed at the evening observance is lost ... or at any rate that's what Pichon thinks. A little further along the treasure trail he would have found Andrew Parrott, who recently has argued persuasively that it isn't lost at all, that the order of the four parts of the Trauermusik has simply been muddled, and that Part 3 is actually the elusive evening music. Curiously, Pichon makes no reference to Parrott, whose interest in the work extends back a decade or so. The performance itself, luxuriating in the princely acoustic of the chapelle royale at Versailles, is well matched to the high quality of the music. Damien Guillon's fragile 'Erhalte mich' ('Erbarme dich') hangs spiritlike above the mourners, with a few small differences in the part‑writing betraying its basis in the less well‑known original version of the Passion (1727). In the bass aria 'Lass, Leopold, dich nicht begraben' ('Komm, süsses Kreuz') the usual viola da gamba obbligato is assigned instead to gently plucked lutes a metamorphosis from bleak contemplation of impending Crucifixion to cosy fireside domesticity ‑ and this is a particularly strange performing decision given Leopold's known proficiency as a gamba player. A greater puzzle is the so‑called 'Dictum', a chorus which frames Part 2 but which has no demonstrable link to movements in the two works already identified and thus no obvious musical source; here it's resolved by adapting the double fugue of the second 'Kyrie eleison' in the B minor Mass, which Pichon, invoking shared symbolism, is convinced is a parody of this movement in the Trauermusik. Pichon's explanation seems convoluted, and all the more so since Parrott takes a very different, much simpler view: surely, once again, Bach had to look no further than BWV198, which contains another chorus that conveniently fits the bill. Parrott's pragmatic solution seems to suit better both the circumstances and Bach's compositional process in the rest of the Trauermusik, but the different theories serve to underline the fact that ultimately all is hypothetical and we just don't know for sure what the Trauermusik was or how it was used. Musicologically minded listeners will perhaps be swayed by Parrott's reconstruction. However, Pygmalion's performance, with fuller choral forces and generously appointed orchestral accompaniment, and beautifully recorded too, may just tip the scales in its favour for those prepared to turn a blind eye to scholarly disagreement.